Craps is without a doubt the most classic of dice games, and just the name brings forth images of Western movies and dices bouncing in slow motion, or gangsters staking up the markers with an elegant broad kissing the dices for luck. Online craps has become a very popular online casino game in the last few years. Less known, especially among online players, is that online craps offers some of the best player´s odds in the market. The best wagers actually have a statistical payout of 99.53% of money wagered, which equals a house edge of less than 1%! Fortunately for the Canadian dice aficionados, Canada offers many good online Craps casinos, and we have listed the best of them in the table below. A quick glance at the playing table might give the beginner the impression that Craps is a very complicated game, requiring an Einstein to understand it, but nothing could be farther from the truth. Playing Craps, especially online, is easy. What makes it look difficult is that the wagering table has up to a hundred different bets, but that´s nothing to worry about, because the bets with the best player odds are the easiest to grasp, and most of the other bets – so called sucker bets, should be avoided, as those bets have abysmal odds for the player. Using the below image of the betting table, we´ll guide you through the different wagers, and then we´ll round up with some general tips on strategy. Welcome! You can start out playing by placing a bet on Pass Line or Don´t Pass Bar, as these are the wagers with the best paid out odds, and form the basis, so to speak, of the game. Below we will go through the different Craps wagers under the headlines of Main bets (whose betting fields in the table above are marked with letters) and Sucker bets (marked in the table above with numbers). We´d strongly advice against playing the sucker bets. They might be tempting considering their high payouts, but the house advantage for these wagers are very high, hence the name. A Pass Line Bet pays even money if the shooter gets 7 or 11 on the initial dice throw, the so called Come Out roll. If the throw results in Craps (2,3 or 12) you´ll lose your wager and the game starts over. However, if you get any other number this becomes your Point number, and you keep shooting the dice. If the Point number comes up before the number 7, you win. If number 7 comes up first, you lose. After the initial dice throw, you are also allowed to place Odds wagers on the original bet. Usually you can wager 3-5 times the original bet on the outcome of your Point number throws. A Don´t Pass bet also pays equal money if you win it. On the On Come Out roll, you win if you get 2 or three, you and the casino push if you get a 12, and you lose your wager if a Natural (7 or 11) rolls up. Any other number establishes a Point number that you roll against, and you win if number 7 turns up before the Point number. As you can see, this bet is a mirrored bet of the Pass Line bet, and also here you can add Odds bets after a Point is establishes. And as for Odds, you should always play the Odds if you can afford it, as the odds are very good for the Point number rolls. 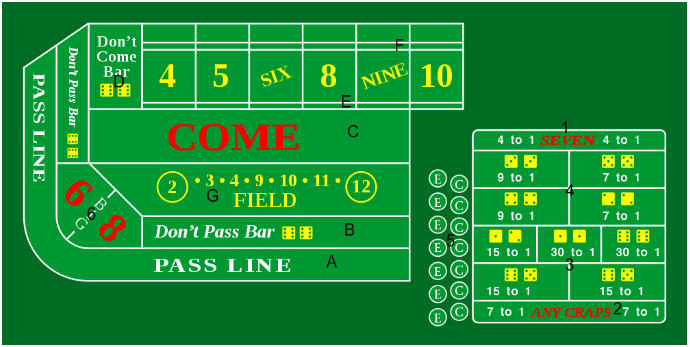 A Come bet can be made after the Come Out roll, and works exactly as the Pass line bet which is not available after the first role. Otherwise it works the same, with the same opportunity to add an Odds wager after a Point number has been establishes. The Don´t Come bet is exactly the same thing as the Don´t Pass bet after the Come Out roll. You can make a Place bet on any of the boxed numbers on the wagering table. Then you keep rolling the dice until you win or lose. Your win if your point number comes up before number 7, otherwise you lose. This is the mirror bet of the Place Bet. You make this wager on any of the boxed numbers and you win if number 7 comes up before the number you wagered on. With this bet you win if the result of the next roll is 2, 3, 4, 9, 10, 11 or 12. Sucker bets, as we have mentioned earlier, are bets with high payout, but a high house edge, and hence, bad player odds. Wagering on Any Seven pays 4x the money if the next dice roll is 7. Wagering on Any Craps pays 8x the wager if the next dice roll is 2, 3 or 12. A Horn Bet means that you wager ¼ each on the numbers 2, 3, 12 and 11, respectively, and you win if any of these numbers roll up in the next dice. This is a bet on hard numbers, meaning numbers that are the sum of two equal numbers on the two dice. The wager is the any of the numbers 4, 6, 8 or 10 will come up before number 7. Hard numbers 10 and 4 pays 7x time wagered money while 6 and 8 pays 9x the money. Wagering on the roll being 2, 3 or 12, or wagering that it will be 11. This is a bet on Big 6 or Big 8, and if the number you´ve chosen rolls up before 7, you win. Don´t Panic. While Craps rules may sound complicated in text, they aren’t. Choose one of our recommended casinos, go there, and play for free. After 10 minutesof playing online craps, you´ll get it. Keep to the basics. Play on Pass, Come, Don’t pass, Don’t come. These are the bets with the best odds, and playing the odds is the only workable strategy for Craps. Always add Odds wagers to you Line/Bar bets (Pass, Come, Don’t pass, Don’t come), if you can afford it. The Odds gave simply no house edge at all, and adding them lowers the house edge for the overall bet to below 1%. Choose a game with a low minimum wager to allow you to play repeatedly on Line Bets and The odds.